Ashok Bajaj’s authentic Italian gem, Bibiana Osteria-Enoteca, located at 1100 New York Avenue, NW, is pleased to debut new seasonal specials showcasing the gem-like white truffle. Italian white truffles are very highly esteemed and are the most valuable on the market. These imported delicacies are exclusively available in the months of November and December. Guest can take advantage of this seasonal opportunity and enjoy Executive Chef Loris Navone’s regional authentic Italian fare featuring a variety of innovative yet traditional antipasti, house-made pastas and entrées, each highlighting the white truffle. These exclusive, featured dishes will be available throughout the truffle season beginning mid-November. Each special incorporates three grams of white truffles with prices ranging from $35 to $75 per dish. Guests can also opt for a three-course white truffle tasting menu priced at $150 per person or $225 with wine pairings (tax and gratuity not included.) Additional white truffles can be added to any dish for an added cost of $15 per gram. The complete list of white truffle specials is posted below. WHERE: Bibiana Osteria-Enoteca is located at 1100 New York Avenue, NW. For reservations or more information, please call (202) 216-9550 or visit www.BibianaDC.com. WHY: The “white truffle,” “trifola d'Alba Madonna,” or “tuber magnatum” is found mainly in the Langhe and Montferrat areas of the Piedmont region in northern Italy and, most famously, in the countryside around the cities of Alba and Asti. Italian white truffles are the most valuable on the market. The white truffle market in Alba is busiest in the months of November and December when the truffle fair takes place. In 2001, the Tuber magnatum truffles sold for between $1,000 and $2,200 per pound; as of December 2009, they were being sold at $14,203.50 per kilogram. Growing symbiotically with oak, hazel, poplar and beech and fruiting in autumn, they can reach five in diameter and 500 grams, though are usually much smaller. 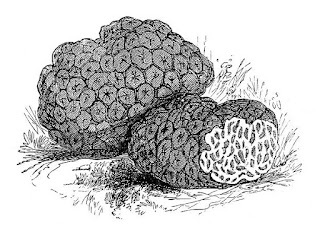 The flesh of the white truffle is pale cream or brown with white marbling.